Do LPG Consumers really have Rs 40 Lakh Insurance cover? You are here: Home / Insurance / Can LPG Consumers claim Rs 40 Lakh Insurance? Can LPG Consumers claim Rs 40 Lakh Insurance? Do you know that as an LPG (Liquefied Petroleum Gas) consumer, you can claim insurance coverage? Are you aware of your LPG Insurance Policy? LPG consumers are protected for accidental deaths and injuries in case the gas cylinders burst. Some newspapers have carried articles on this topic (as below), and of late these reports are being widely circulated on Social media platforms (Facebook, Whatsapp etc.,). 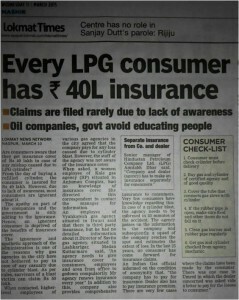 As per the above media reports, LPG Consumers can claim insurance coverage of up to Rs 40 Lakh, in case of any accidents. This is partly true. LPG accident victims are covered for death and accident, but the insurance coverage is not Rs 40 Lakh, as reported. Also, the oil marketing companies do not take any special insurance policy or coverage for individual LPG consumers. Both, the LPG companies (oil companies) and the LPG Distributors (Gas agencies) take Third Party Liability Insurance. No premium is collected from the LPG customer. The LPG accident victims can claim insurance from the company and also from his/her local Gas Agency (distributor). This third party liability policy (public liability policy) provides personal accident cover, reimburses medical expenses and covers property damage at authorized customer’s registered premises. The sum assured given to the accident victims is based on per event (accident) and per person (victim). Personal Accident cover – Rs 5 Lakh Per Person Per Event. Medical Expenses Max cover – Rs 15 Lakh Per Event. In addition to the above insurance, the LPG distributors also have third party liability insurance to cover losses, in the event of an LPG accident . I have tried to get the ‘third party insurance cover’ details from my distributor, but without much success. You may also try to get the details from your respective cooking gas distributor. If you are able to source some information, do share the details. How to claim the insurance in case of an accident? Procedure to be followed by the LPG customers.. In case of the unfortunate event of an accident, the LPG customer must immediately inform the distributor in writing. The distributor then informs the concerned oil company and the insurance company about the same. Customers are required to submit to the Oil Company the originals of Death Certificate(s) and Post-Mortem report(s) /Coroners report/Inquest report, as applicable, in case of deaths. Customers are required to submit, Original Medical Bills, Doctors’ Prescriptions in original supporting the purchase of the medicines, Discharge Card in original and any other documents related to the hospitalization in case of injuries. In case of property damage at customers’ registered premises, the Insurance Co. appoints their Surveyor to assess the loss. Your local distributor has to assist you in completing the formalities of an insurance claim. To ensure that your claim is not rejected, you should use ISI-mark accessories (such as lighter and gas pipe). You should also ask your gas dealer to carry out maintenance checks at regular intervals. Every year hundreds of LPG cylinder related accidents are reported. 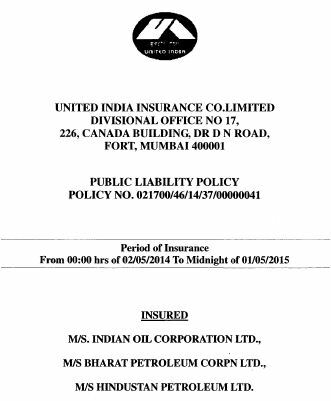 Oil marketing companies and Distributors pay crores of rupees as Insurance premiums. 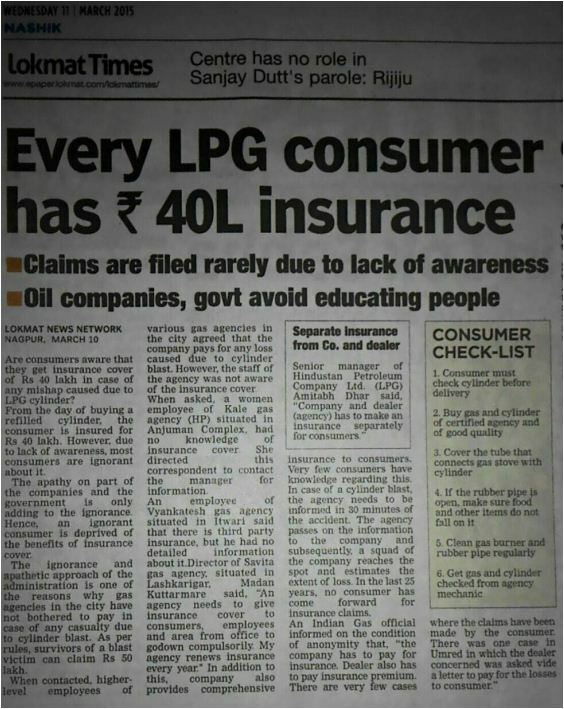 But due to lack of awareness about the LPG insurance policy, not many insurance claims happen. Actually, Gas Agencies are supposed to display information about the LPG insurance policy on their notice boards. They should inform customers about the insurance cover. But no such measures are being taken. So, share this information with your friends. Spread the word. please advised to me the any insurance of cylinder than catch the fire durinfg working. If your claim is genuine, suggest you to escalate your issue with senior officials of your LPG company. Are you referring to LPG distributor or are you contacting LPG company directly? Patna Office had sung, I did not receive any help, I have spoken to you for months, but I have not heard anything yet. Kindly first register FIR at police station & give complaint at your LPG distributor office for insurance claim. Dear Rohit ..Sorry to know about the loss of your mother! Did you inform about the unfortunate incident to your Gas distributor/ LPG company?? You can escalate the issue with your LPG Gas company directly. Kindly visit your lpg company’s portal and submit your complaint/grievance. My Neighbour suffrered with loss of Property (Mess) due to Fire accident caused either by short circuit of Gas blast which is not sure. Dear Kiran ..You may suggest them to inform Gas distributor & Police dep immediately. Can submit insurance claim with the distributor. They may investigate the incident. Dear Ramcharan ..Kindly refer to our conversation in Linkedin..
As per above discussion, It is came to know that consumer need not to pay premium/ or take any insurance for this. Now, my question is, from few days some people came to home and forced us to take Insurance otherwise we won’t get riffled cylinder. Please suggest what action need to take? Dear Khayum ..There is no need to apply for any separate insurance for this, if you take LPG connection then automatically you are eligible for this insurance. No need to pay any insurance premium too. really a goood news as iam not aware of this insurance before seeing this post. every lpg customer should know it. Dear anil ..The coverage amount is Rs 40 Lakh and there is no need for you to pay any premium. Recently I got Fire Accident in My Home Due to Gas, Luckily We are Safe. But I Have Lost All My Property inside Of My Home So, Pls Let Me Know Is there any Insurgence for my Fire Accident. It Would be helpful for me. Dear RAZAK..Did you file FIR in the nearest police station? Kindly visit your LPG distributor office, inform them about the accident and submit the claim forms. My elder bother’s house complete damaged due fire on dated 03/09/2016 ( suspected due to gas cylinder vrust/ electric shurtcurit) at 1.30 AM approximately. Can he is eligible for calming the insurance. Dear Umesh..If the accident is due to cylinder burst then you can contact your LPG distributor and submit the claim form. Also, do inform about the accident to Police. Dear Bala.. Kindly contact your LPG gas distributor immediately and inform about this accident. sir, how to get for cylinder in kolkata. i damber subba Iam service in kmc kolkata. Iam staying rented in pannasari (behala) the owner of house not rent ed receipt .because my document all kalimpong add. I went to needed for cylinder. U r doing a great work, providing awarness itself a good work. They are paying lots of money on the name of tax. And more important income tax if a person gets 10 lacs of earning he almost pays near about 3 lacs with the name of income tax,…..
It’s a law, we have to abide to it, whether we like it or not. Govt needs money to serve public and build economy and income tax collections are one of the primary sources of income to the Govt. Dear aditya ..You need to inform about the accident to your LPG distributor. The distributor then informs the concerned oil company and the insurance company about the same. You are required to submit to the Oil Company the originals of Death Certificate(s) and Post-Mortem report(s) /Coroners report/Inquest report, as applicable, in case of deaths. Dear aditya ..I believe that they are mis-leading you. Sir, my friend has applied for lpg fire accident death claim .The distributor had rejected the application by saying that he was surprised to hear the death caused due to lpg leakage accident and the accident happened at June 2014 the application was filed in February 2016 he simply rejected why you have not applied for nearly 18 months. in the application it is mentioned that the delay is due to awareness and nothing else thanks that . since he is uneducatedtthough the occurrence was informed to the dealer immediately but he don’t know about the. claim procedures . what is the next step he has to take ? Whether to apply to the higher office or to file in consumer forum or in civil court of law ? Then your title says up to rs 40 lakh can be got but in the box news it is mentioned as rs 5 lakh for death rs 1 lakh for medical treatment and rs 1 lakh for property damages and at the same time it is mentioned in the same time mentioned in the United India insurance company policy as rs 10 lakh for death and rs 50 lakh for event which is correct , it is confusing please explain it clearly . Thankyou . Sir.i want the united india insurance company poicy number and the address to send notice . Dear Gunasekaran..Kindly contact your respective LPG Gas distributor. Dear Rajesh..No premium is collected from the LPG customer. Sir , is their any prescribed format for claim if so I need it. Then on what basis the victims will be paid? ex. age ,income, dependants how it can be notified to company ? Can we claim as that of MACOP cases ?I want. details for claiming LPGas accident death .please assist me. Dear Gunasekaran..As of now I do not have any template. You may take help from your LPG distributor. You can notify about the claim (if any) to your LPG distributor. An incident take place last week, my mother get injured by Gas and burned, then my family doctor is giving treatment at home. Please guide me if we can file claim, if yes how ? Dear saurav..Yes, you can claim. Kindly follow the claim procedure as given in the article. Very great initiative.Please keep it up. Still we need more and more awareness on LPG accidents. Thanks for the great information sir. because of that mere house ke 1st floor per aag (fire) lad gayi ore sab kutch damage ho gaya that . kya mujhe es damage ka compensession mil sakta h .
Es insurance ko hum kaise claim kar sakte h .
* Cylinder bhi neighbour ke home per hi blast hua that. Dear Shyam ..Your neighbor can claim LPG insurance. You are also eligible to claim ‘Third party liability insurance’from the concerned LPG distributor / LPG company. neighbour ne to upbhokta forum mein case file kiya hai Gas Company ke against. Suggest you and your neighbor to approach the LPG distributor and submit insurance claim forms. When did the accident happen (date)? to me against propery damage ). after few days the Gas company officer /insurance valuar visit the accident site ( my and neighbour’s house) . after that Distributor assures us that the papers has been submitted soon we get the claim. on soon we get the claim. now pls suggest what i have to do ……. Has the police been informed about this accident? I am sure you too are eligible to claim ‘Third party liability insurance’. Suggest you to approach a lawyer and get legal opinion in this matter. good information but people need awareness……. Good informative website. Do u know when, I mean in which year this insurance started? how can claim gas connection accidental case. You are welcome dear Appalaraju . Keep visiting! You have done a Great Work. Thanks a lot. Please continue on the common issues. You can visit your Gas distributor and try to get the insurance cover details. All LPG customers are covered under this insurance. Great work indeed! Thank you very much. Pl. continue the good work. kindly let us know distributor provide the bond . or personal we will ask to them?